On the one hand, progress has been made in all selected indicators and in all world regions. Yet looking at the implementation of MDGs for the selected 10 indicators for Developing Regions 8 indicators were behind the lines for between 4 years and nearly 13 years. The largest delays were for maternal mortality ratio and prevalence of underweight children under-five years of age; by regions in sub-Saharan Africa, Western Asia and Southern Asia. Official Development Aid: tracking the timetable for reaching the UN target of 0.7 percent of GNI with time distance showed that the performance in 2008 was off the track: the delay of four years for DAC total. Sub-Saharan Africa by countries: for 8 indicators S-time-distance analysis was in 79 percent of cases behind the lines to target and 21 percent of cases ahead of them. The worst situation was for the indicator percent of the population undernourished. The percentage rule for determining the MDGs target understates the progress made in Africa and puts a much more demanding target in terms of feasibility to regions and countries with more difficult starting positions. Under-five mortality rate for 150 developing countries: 54 countries were ahead of their line to MDGs target and 96 countries lagging behind. The application to monitoring of the MDGs gives a new broader understanding of the situation in a dynamic context to enriching the policy debate. 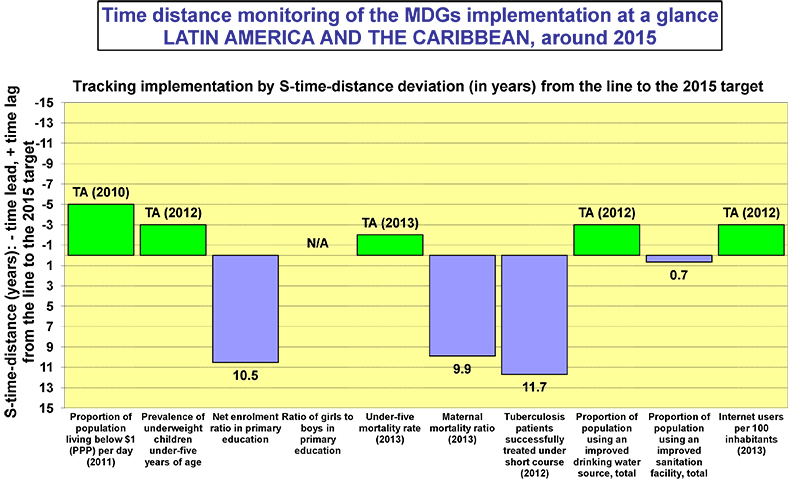 The time distance methodology can be usefully applied also in monitoring plans, budgets, forecasts, etc. and SICENTER developed a free web tool to facilitate this for interested users.